Nuclear Magnetic Resonance (NMR) Spectroscopy remains the foremost analytical technique for the structure elucidation of organic molecules and an indispensable tool for the synthetic, medicinal and natural product chemist. New techniques continue to emerge and the application of NMR methods continues to expand. 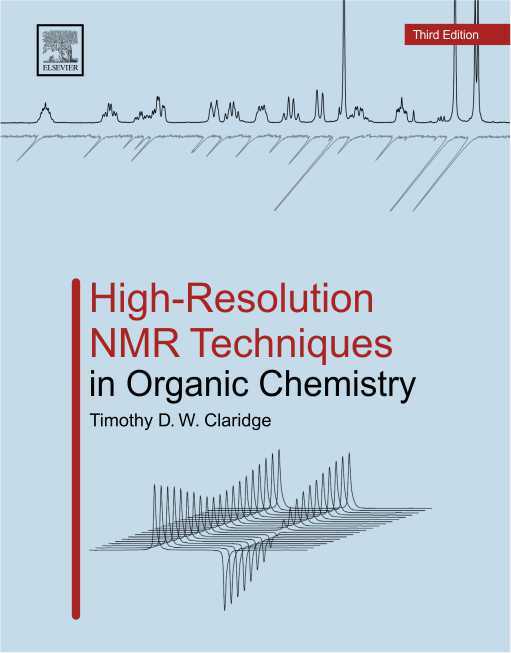 High-Resolution NMR Techniques in Organic Chemistry is designed for use in academic and industrial NMR facilities, as a text for graduate-level NMR courses, and as an accessible reference for the chemist's or spectroscopist's desk. Figures from the third edition are available for downloading as Powerpoint files from the publisher's support site. Please acknowledge their source as appropriate if used in presentations etc. -Recent developments in the field, with practical guidance on implementation, execution, application and interpretation. -Advances in hardware, pulse sequence development, and associated experimental methodologies. -Dynamic effects in NMR spectra and measurement of exchange rate constants by NMR. -Modern experimental developments including pure shift NMR, residual dipolar couplings, hyperpolarisation, NMR with multiple receivers and fast methods. -A new chapter on protein-ligand binding experiments. -A new worked example chapter on structure elucidation using 1D and 2D NMR techniques. "This is a very well produced and nicely laid-out book.... the descriptions, explanations, diagrams and spectra given here are clearer than in most of its rivals"
"The explanations are clear and concise... the references are well done and up-to-date. This book is a practical guide for the beginner as well as a launching pad for the NMR enthusiast. It should be found in every NMR facility." "The book is an excellent reference source and guide for the most common NMR experiments used by organic chemists, and it is also an excellent textbook for organic graduate and postdoctoral students.... Overall this a very good text, both well written and easy to understand....I highly recommend the text." "For the budding NMR spectroscopist, for the synthetic chemist with an interest in and contact with NMR spectroscopy, and also as a foundation for graduate-level courses on NMR techniques, this book is highly recommended... It is essential for every NMR laboratory dealing with small and mid-sized molecules"